One of the performers in Talking Treaties Spectacle, “a mobile performance artfully sharing Indigenous knowledge and history” presented by Jumblies Theatre at Historic Fort York, reveals that he used to think that treaties were large, ornate gilded papers preserved in books, argued over by lawyers from both sides and fairly agreed on by everyone. This turns out to be anything but the truth: treaties have often been unequal, deceptive, neglected, and even misplaced. 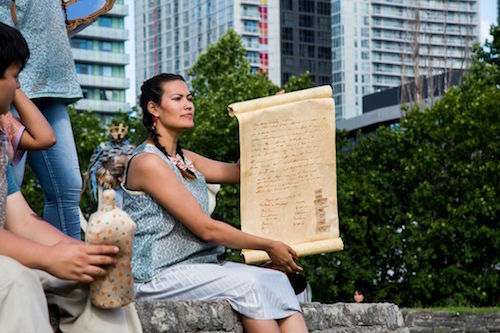 Talking Treaties is a mobile, interactive history lesson based on three main agreements: the Dish With One Spoon Treaty, the Covenant Chain, and the “Toronto Purchase” with the Mississaugas of New Credit (the last only legally “settled” in 2010). The inclusion of the Dish With One Spoon Treaty, which originated between the Haudenosaunee and Anishinaabe as a covenant about sharing limited resources, nimbly reminds us that there’s no such thing as a monolithic Indigenous culture. It also presents a treaty that actually works when everyone respects it. This is compared to treaties made with colonialist powers, which were eventually exploited with language smacking of imperialism and paternalism, seeking to create boundaries and ownership rather than share responsibility. This is a community production in every sense of the word – it’s about community, for the community, by the community – and therefore has to be reviewed in that spirit. As a community-building exercise, it’s a major success. There are seven main performers, a band of travelling musicians, and an even larger group of community members that form a choir, a commenting chorus and a method of directing the audience. The group includes people of all ages and abilities, and it’s hard not to be moved by their participation and their voices. The audience is almost constantly travelling around the grounds of Fort York, save some longer stretches inside the buildings. This location is inspired; as some of the events took place here, the performance becomes a living history where we discuss things long buried under our feet. The perpetual motion means it’s almost impossible to disengage. It can get a little cold out, particularly once the sun starts setting, so the company provides blankets and scarves. Wonderful props (Sonja Rainey) and costumes (Marianne Alas) maintain a handcrafted feel, with every item lovingly made and quite beautiful, from a redcoat uniform and enormously-bustled dress to the inflatable-mascot-style Beaver and Britannia. Thoughtful use of props gives the audience a clear sense of just how much, for example, Toronto was “purchased” for (it’s not a lot). A scene where myriad stuffed beavers and raccoons are flung in the air in exchange for goods is very entertaining. Later on in the show, there is a short, interactive lecture about the long process behind the project, and the hundreds of people involved to make it the most thoughtful and authentic storytelling possible. While normally it wouldn’t make sense to stop a show to talk about its dramaturgy, this struck a good balance of letting us become involved in the story before giving us some much-needed context. It’s this context that is sometimes missing in other parts of the show, which can lead to confusion. Even my guest, a rather brilliant playwright, said that she sometimes felt a little lost. This was partially due to the large amount of text and unamplified outdoor space; though action at least stops for passing trains, and actors are mostly adept at projection, it’s still a challenge to catch every sentence. Luckily, the overall concept and message are clear; even if some details get lost, you just have to accept that it’s a shifting, conceptual narrative instead of a linear one. Characters like Sir William Johnson (Jesse Wabegijig) and his common-law partner, Molly Brant (Jill Carter), a Mohawk woman (and Joseph Brant’s sister) instrumental in fostering the relationship between their societies, become almost unmoored in time, drifting through the rest of the work as a reminder of the layers of history. An extended scene featuring the two is possibly the most captivating in the show, and could only be improved with a little more initial context. The family-friendly aspect of the show does lead to a few tonal inconsistencies, with the delivery of some segments seemingly aimed at kids, but the volume of information likely going over their heads. Overall, though, Talking Treaties is a successful bid to “polish the chain” and continue talking about the complex issues of land “ownership” and how Indigenous peoples are treated in Canada. As director Ange Loft says, it’s not enough to do land acknowledgments without actually thinking about what they mean, and what we owe to each other and to the land itself. Shows run Friday-Saturday at 5:30PM, and Saturday-Sunday at 2:00PM. Tickets are PWYC, and can be purchased in person. Advance reservations can be made by emailing info@jumbliestheatre.org.